Here is another device to help you locate your downed R/C sailplane in the bushes and weeds. Similar to the other design, this circuit plugs into a spare servo socket on your receiver, and it is a pulse omission detector. The alarm sounds when pulses originating from your transmitter are no longer being received--turn off your transmitter to turn on the alarm and help you find your plane. 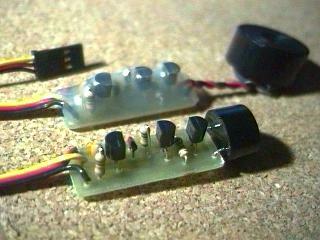 This circuit is simpler than the other design, is much easier to build, but is not quite as specific. While the other design tests for a specific frequency of pulses, this design is less picky, and may not work quite as well in areas with more radio frequency background noise. This design was originally collected from another web site, but the site has gone off-line and I'm unable to give proper credit to the individual. I modified the original design a little to make it work more reliably with the more aggressive automatic gain control of some of the current receivers.